Please follow us on social media and like our posts to help promote our sport. To stay up to date with AOA news and events and to receive some interesting, relevant information please connect with us. As always, it was a pleasure to follow our Albertan masters athletes at the World Masters Games. It is incredible to see their passion, enthusiasm and ability to have fun at a world class event. Congratulations to all who attended, you are our motivation! From Calgary: Kitty Jones, Marion Owen, Marsha Fehr, Christin & Lennart Lundgren, Jane Rowlands. From Edmonton: Angela Pearson, Robert Gilchrist, Eugene Ulmer, Greg Yarkie, Geraint & Marilyn Edmunds. The Sprint events (model, qualification and final) were on 3 different university campuses in Auckland, all very technical. 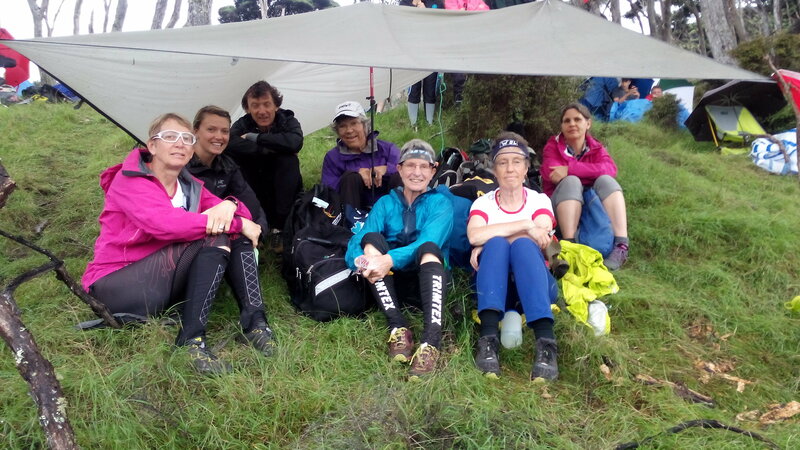 The Long distance events (model, 2 qualification races, and final) were NW of Auckland with challenging terrain in pine forest and sand dunes along the edge of the Tasman Sea. There were 1800 participants ages 35 - 92! The courses were excellent, the weather was perfect and the organizers were enthusiastic and smiling. 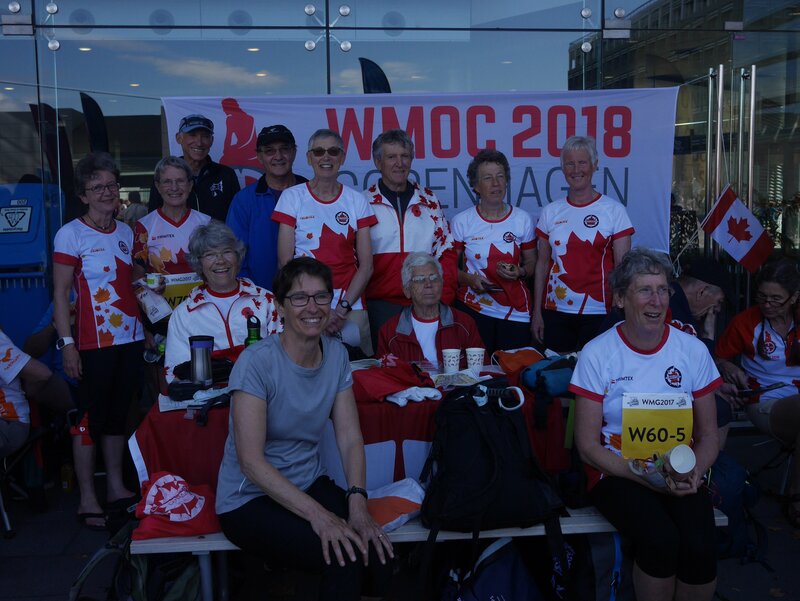 This is probably the last time that orienteering will be included in the World Masters Games, as the International Orienteering Federation (IOF) recently decided to opt out and keep the World Masters Orienteering Championship separate from the World Masters Games. There was a lot of preparation to launch an event on May 24 in both Calgary & Edmonton, to focus on public engagement. Unfortunately, the weather did not cooperate. Due to a snow storm Calgary had to reschedule their event to June 7 and Edmonton participation was low because of bad weather too. Hopefully, we will be luckier next year and we can join the 243,688 participants from 71 countries to celebrate our sport. Wow, what a great Spring Skill Camp! Thank you to the EOOC leaders for organizing this very fun, eventful, busy weekend. We got to enjoy the beautiful place both at Strathcona Wilderness Centre and the Blackfoot orienteering map. We had a chance to see Geraint’s mastermind activities, Dorothy's smile and energy, Marilyn’s constant support and great coloring contest and of course the very delicious food and service from Peter and Drew in the kitchen all weekend long (it was heroic). I am sure much more helping hands were provided so thank you to all. We have only received positive feedback about this joint camp. AOA organized the advanced group activities designed by Raphael (in Europe) and we were lucky to have Magali ‘s superb coaching ability. The advanced group got a lot out of it for sure. It was exciting to see so many people out for the day - the fields were full of cheerful people. More than 135 participants attended, including many Kids Run Wild families and a number of SOGO juniors from Calgary (supported by SOGO coaches Clarence and Bridie) who all enjoyed not only orienteering but the social environment of the camp too. AOA is hoping to support and grow a yearly skills development camp for everyone to enjoy, so stay tuned for the 2018 SPRING CAMP. 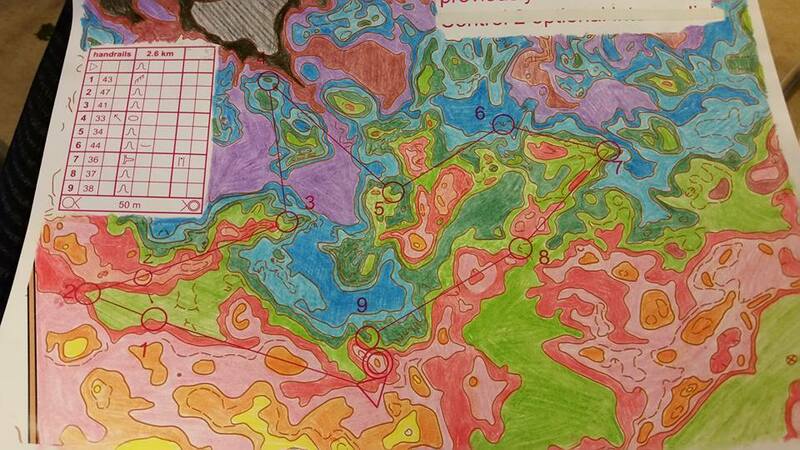 Creative way of understanding contours.... color first .....then try to run with this map! Analyze Performance and Support the Competitive Experience. For everyone who has experience and would like to get involved with coaching orienteering. Please REGISTER ASAP on our website. The 2017 Western Canadian Orienteering Championships will have sprint, middle and long distance events on two new maps in uniquely challenging sandhill terrain. Visit this site at www.wcoc2017.ca for more information. This will be the 50th Canadian Championships - it will be centered in the beautiful heritage town of Perth, Ontario. Need a vacation plan ? Travel east and attend the series of events, including the Eastern Canadian Championships July 29-30, as part of O-Fest. We are looking for some ideas to make it fun and worthwhile for people to attend. Please send us suggestions about what would make it valuable for you to attend. Invite someone you know to one of these events! 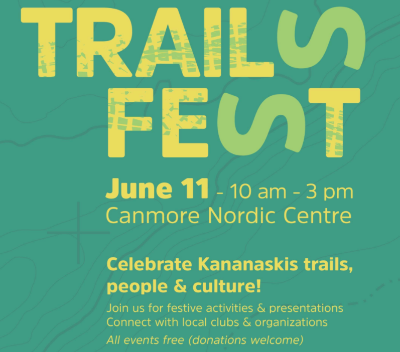 Friends of Kananaskis Country will host the 3rd annual TRAILS FEST at the Canmore Nordic Centre and we want you to join us! A celebration of Kananaskis trails, people, and culture - the event will consist of multiple activities that showcase the many ways trails are used. ATTEND A WILD-SMART program to feel more confident at orienteering events in bear country.Free sign up here. Learn more about human impact in Bow Corridor by joining Alberta Environment and Parks for an interactive presentation.Ever wonder how trails are used - human use, wildlife use, recreational use? Here is your chance to learn more about it. 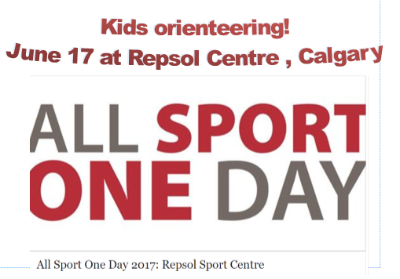 At Repsol Centre (formerly Talisman Centre), the sport of orienteering will be featured for kids ages 9-12 led by FWOC volunteers. This will be a fun activity, trying map reading and control finding. Kids really enjoy this outside adventure , it's like a treasure hunt with a purpose. Ask your friends with kids to sign up free to secure a spot! Would you like to help out with this event? Contact FWOC volunteer sign up. Community Outreach Program in Sundre, June 17th. If you know anyone in the area please spread the world! 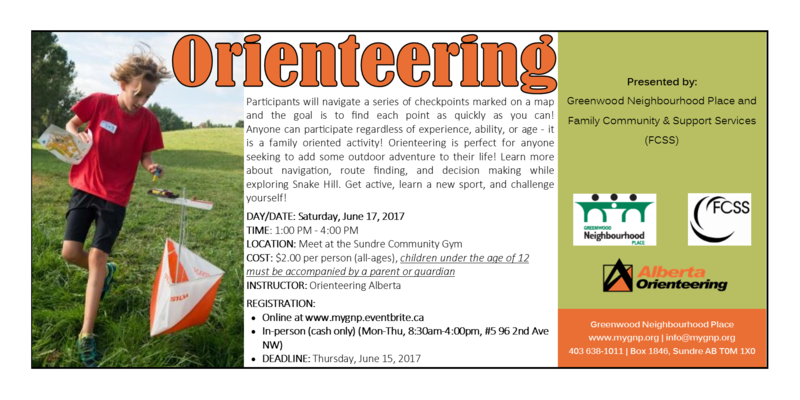 Did you know that Orienteering is one of the City of Spruce Grove - Your Local Government's Canada Day activities? Edmonton Overlanders Orienteering Club & Kids Run Wild are sure getting excited about this special day! Orienteering Summer Camp in Edmonton- How cool is that? Kids Run Wild will be offering Summer camps again this year - one week in July & another one in August. Registration will be open soon . The following 3 athletes from Alberta will represent Canada at the 2017 Junior World Orienteering Championships in Tampere, Finland, July 9-16. We are proud to cheer for you! Darya Sepandj, Emma Sherwood andMichael Svoboda. EOOC's Will Critchley and the FWOC Adult program coach Damian Konotopetz is heading to the World Games in Poland for orienteering! These events take place July 25, 26 & 27. Find out more here, #OrienteeringCAN. Do you enjoy reading race reports and browsing maps? Check out TEAM CANADA BLOG or damiankonotopetz.blogspot.ca. Club Events happening regularly through the summer. AOA would like to encourage members to attend events that are organized outside their own club. It would promote attendance, fun and building relationships. Check out the EOOC andFWOC websites for calendar of events, updates and sign ups. Let's challenge everyone to attend at least one event which is organized by the other club. If you attend one of the other club's forest event or Wednesday night event, submit your name with the event date for a chance to win a cool draw prize. The winner will be drawn at the AOA retreat from all the names submitted between June 1st and November 1st, 2017. (Alberta Championships does not qualify for the submission). To enter: send your name and the event to info@orienteeringalberta.ca with Subject: AOA contest. Multiple entries are accepted for different events, so the more events you attend the better your chance to win! Just a reminder about AOA dedication to optimize the development of Alberta orienteers as athletes and leaders in the sport and to raise the profile of the sport. Leadership Grant: Encourage AOA members to attend courses, clinics, workshops and conferences (either in Alberta or outside Alberta) that develop officials, coaches, mappers and/or club leaders. High Performance Grant: Support the elite athletes (AOA members) who are named by Orienteering Canada to the WOC, JWOC, WUOC, World Cup(s) and World Games National Teams and who also belong to HPP. Also, support coaches and team leaders of National Teams who are AOA members. Pursuit of Athletic Excellence Grant: Encourage AOA members to compete in out-of-province and international orienteering training camps and competitions at the Canada Cup level and higher. Please remember to apply by December 1st each year. For details visit our website fo the Grant Policy document and email info@orienteeringalberat.ca for the application form. Have a great, eventful, orienteering summer!